It&apos;s no secret that I love Des Moines. I could probably write weekly love notes to my fair city. Especially lately… so many wonderful DSM opportunities. In fact, my business is a business because I&apos;m here in Des Moines. It may sound bold, but I believe, strongly, that it&apos;s true. I met Tiffany from the Greater Des Moines Convention and Visitors Bureau who asked if custom illustrations of my beloved city was something I&apos;d be interested in doing. After a few coffees, some quick sketches in my trusty notebook and several email exchanges, we started working together on a really great project that honors the city which helped me to bring my dreams to life. Working with the CVB is an opportunity for me to show my love for Des Moines through my illustrations. 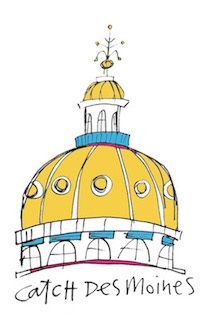 Seeing these sketches of my city come alive in Catch Des Moines colors… oh man it is cool. This city (my city) is vibrant, full of chances for a young professional like me to showcase their skills through interesting collaborations. I&apos;m so grateful that Tiffany and the CVB team gave me the opportunity to show my work in a way that expresses their vision in my style. A truly awesome collaboration. Stop in. High Five the CVB peeps. (A group of people who love this city just as much as I do.) 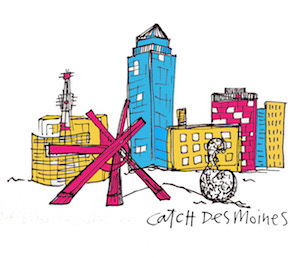 And pick up your Catch Des Moines postcard today. Laura Palmer is the illustrator behind XO-LP. A lifelong Iowan who values a philanthropic spirit, the United States Postal Service and a thoughtfully handwritten note, Laura started XO-LP in 2009 producing little greetings made with highlighters, markers and wit.